Recently, I posted about a dehydrated spirit. 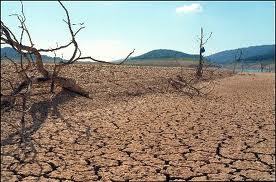 There are some of us who have gone so far beyond the dehydration that we're in the midst of a full-on drought. Not only is our spirit in need of some nourishment, the repercussions of living dehydrated for so long also need to be taken care of. It's hard to know where to begin when things look as bleak as they are. Sometimes when you stand back and survey the damage, things look so hopeless you want to do nothing more than curl up and die because a solution seems impossible. Matthew 19:26 tells us that Jesus said, "With man, this is impossible, but with God, all things are possible." Isn't it refreshing to know that we don't have to rely on our own power to get things done? Most of the time, we assume that, if something must be done, we have to take care of it. We don't delegate, we don't seek assistance, we just power through and sometimes fail miserably. We do the best job we can at repairing things, making amends, patching up, starting over. But the truth is, any attempt we make alone is going to pale in comparison to the beauty that could be if only we would give it all over to Him. You cannot accomplish the overcoming of a drought in a single day, a single simple lesson, a single session of searching for a few verses for inspiration. You cannot take a single watering can to a dry, cracked patch of earth and expect to sprinkle enough hydration on it to see it lush and blossoming in 24 hours. There must be persistence, endurance, hard work, and -- the key -- several steps. You start with something small, somewhere. You do what you can in a single moment. If you do nothing, nothing will change, except sometimes for the worse. If you do something, anything, albeit a tiny step, you will put yourself on the right track. Let's take an intense, overwhelming hatred for someone who has truly ruined a big portion of your life. You can't just make up your mind to have a loving, mutually beneficial relationship with them, forgetting the past and starting over the way you envision things could have been. There is so much bitterness and resentment built up in your heart, so much desire for vengeance, so many hurtful memories, so many incidents with that person you can't even count them. But you can take a step. You can ask God to help you do one small thing on your journey. You might not even be able to forgive them right away, but you can begin by an analysis of your own heart. You can search for things, something, anything you might have in common with this person. You can try to even the field, stop feeling so superior and realize that you are both flawed human beings, both children of God, whom He loves equally. You can search yourself to see what you might have contributed to the chasm between the two of you. Nothing happens suddenly -- you won't wake up and feel relieved of all the pain and hurt and resentment one day without taking steps toward that. But you will, one day, if you make a concerted effort to take small steps everyday to get to that point. We can't do anything. God can do everything. It's a matter of allowing ourselves to become vessels for Him to work through. I might not be able to love someone I hate right away, but I can allow God, working through me, to show me what He loves about them. Why He died for them. Give me your eyes so I can see." With God, all things are possible. The closer our connection with God, the less chance we have of a drought. If you find yourself dehydrated, quench your thirst right away, and then share with others. If you're already in a drought, start with small steps... take a few sips here and there, and you'll find yourself more able to receive the hydration than you were before. I've read this a couple of times in the last two days. As always, you're speaking right where I am. I keep telling myself over and over, "With man, this is impossible, but with God, all things are possible."